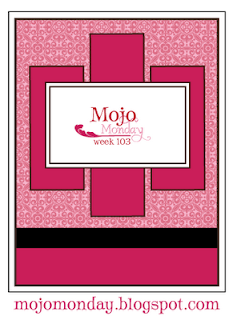 So, I'm a little late getting my Mojo Monday card posted. But better late than never! This month is a contest month, so there are a million entries going, but I figured, eh, what's one more? I decided to keep my card clean and simple, like I like 'em. No background dp, just the cardstock itself. I did sneak a little bit of Candy Lane dp onto the card both as the vertical panels and at the very bottom. The horizontal panel took me a little bit... I just couldn't figure out what I wanted to go there, and it definitely couldn't be too tall or it would make the card feel off-balance. I finally settled on this lovely little sentiment and added some flowers to liven it up (and a few brown jewels!). I popped up the entire sentiment panel and the two flowers to add some dimension to the card. I'm off to church this morning, and then running a few errands while I have the time and energy. Then it's home to do more stamping! Yay! I have a few more cards that I need to crank out this weekend before the work week strikes again. This next week will officially be my first full week with my new kiddos and they'll probably be just as tired as me by Friday. Well, thanks for stopping by today! Love these colors Kristina!! Gorgeous card! I feel like i haven't talked to you in forever!! Hope you have a great first full week with your kids! !